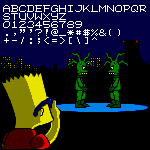 Recreation of the pixel font from Imagineering/Arc Developments' "The Simpsons: Bart vs. the Space Mutants" (1991) on 16bit systems (Sega Mega Drive/Genesis, Amiga, Atari, MS-DOS). Info: Created on 29th January 2017 . Last edited on 29th January 2017.